Apple cake, always a favorite dessert for any holiday or special occasion. This cake has a delicious Caramel Glaze, and if you want you can make the little marzipan decorations included in this recipe. A very pretty and festive dessert for Thanksgiving. Preheat oven to 350 degrees F. Generously grease a 12-cup bundt pan. In a large bowl, blend together all ingredients for cake batter except nuts and raisins. Beat 2 minutes at high speed. Stir in nuts and raisins. Spoon batter into prepared pan. Bake 45 to 55 minutes, or until toothpick inserted in center comes out clean. Cool upright in pan for 30 minutes; invert onto serving plate. Cool completely. In small saucepan, melt 1/4 cup butter. Stir in brown sugar; remove from heat. Add powdered sugar, vanilla, and milk; blend well by whisking. Spoon caramel glaze over cake. 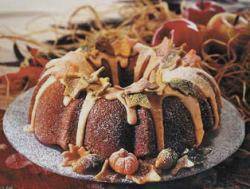 Decorate with marzipan pumpkins, leaves and acorns. For Pumpkins, tint a medium piece of marzipan with orange food coloring. Shape into small balls and shape into pumpkins. Shape a medium piece of brown marzipan into a pumpkin stem. For Acorns, tint a small piece of marzipan with brown food coloring; divide into two pieces and add more food coloring to one of the pieces. Shape the light brown piece into a small oval, making one end pointed. Use dark brown piece to form acorn cap; place cap over the oval end of the light brown piece. Add texture by cutting V's into it with a small knife. To Make Leaves and Stem, tint small pieces with orange, yellow, green, and brown food coloring. Roll out small pieces, dusting surface with confectioner's sugar to prevent sticking. Cut with a small leaf-shaped cookie cutter or cut leaf shapes with paring knife. When I was making this cake, it smelled and seemed like a "apple pie" cake, and the batter was very thick. I wasn't sure whether it would turn out to be good or not, but it was so delicious when I had the first piece. Great recipe and easy to make. Must try!!! i have made this cake for 3 different occasions now, including a food day at work and everyone has devoured it every time! excellent recipe! Delicious and makes a fantastic presentatation when made in a rose bundt pan, people were taking pictures before it was cut. Added chopped nut to carmel glaze. it was so good making it I found your recipe and made it for thanksgiving, starting out skeptical. However, the results were fantastic, and it was the hit of the evening. Will be making it again for christmas! Wonderful holiday dessert. I found your recipe and made it for thanksgiving, starting out skeptical. However, the results were fantastic, and it was the hit of the evening. Will be making it again for christmas! I found this recipe in my local newspaper once and I lost it, boy was I glad to find it again!!! It's perfect for any time of the year. Thank God for internet!!! Delicious and simple to make. Rich, full of flavor, and it made the house smell divine while it was baking. I'll definitely make it again! Perfect dessert choice for Thanksgiving, a meal that already has alot of pies. Fresh and wholesome tasting. Easy to prepare (one bowl mixture). Unable to get my carmel glaze to drip?? Marzipan decorations were very impressive. I just won a baking competition with this cake! (No money, just glory.) The cake and icing are easy to make and the marzipan decorations really put this cake "over the top." I also added some melted vanilla frosting under the caramel frosting to add color and dimension. I'll be making this again for Thanksgiving! I made this cake for Thanksgiving and the family loved it. They thought it was so pretty! I am making it again for Christmas only this time I'm changing the decorations. I love this recipe!!!! The only thing I would recommend to people is to dice the apples after slicing them. The large apple slices makes it hard to cut into the cake. But other than that, delicious! I also whipped the eggs first then added the sugar, then the rest of the ingredients, which made the cake even fluffier. This cake has become a hit for my family for the holidays.. my dad even requested it for his December birthday! I sliced the apples very finely, about 1/4" wide slices, and they folded beautifully into the batter. The only change I made was making a little thicker caramel glaze, because when I first attempted this glaze it was a bit liquidy. The cake itself however, is divine! Does anyone know if you can cook this in a ordinary cake tin? A tradition for Thanksgiving since 2005. I used about 2/3 of glaze then added 2 drops red and 4 drops yellow food coloring a good fall color pouring the colored glaze over the natural color.